Got a question? We have crazy yoga skills to read your mind (just kidding). Look to the right and see if we can answer your question. Can I watch a class to see what it’s like? There’s plenty of yoga on YouTube so you can see what it looks like. If you just want the occasional stretch, then once a week is fine. If you want to lose weight, get fit, develop flexibility, improve your energy, sleep better, improve your mental and emotional health then ideally practice 3 times per week or more. The more often you practice, the sooner you’ll get the results you’re seeking. Also, the calming and relaxing effect of yoga will wear off pretty quickly if you don’t practice several times a week. If you’re seeking a change, you have to change your routines and that might include finding some more time for yourself to practice at home or in the studio. It takes more than a few yoga classes here and there to make a difference to our physical and mental health. We know that gyms and other fitness places do free trial classes but we don’t. What we offer is quality yoga and quality isn’t free. We want to develop a relationship with our customers and we want people who value what we do, how we look after our staff and how we contribute to the community. And we feel that our Intro offer of 5 classes for $30 is really fair and reasonable. Your first 5 classes are only $30 and you have 2 months to use them. A single class is $20. Free street parking is available on Stanley Street East, Withington Street and Disdbury Streets. Please respect our neighbours and avoid blocking their driveways. 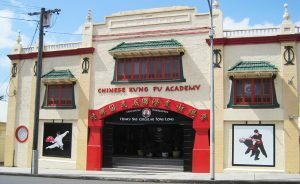 We are located upstairs from the Chinese Kung Fu at 963 Stanley Street East in East Brisbane. How busy are the classes? We cap our classes to 30 people for comfort. Yin yoga classes average 25 people. Make sure you have the all clear from your healthcare practitioner. We are able to cater to many people’s needs. If you have concerns about whether yoga will be right for you, call us or email and we can chat about your needs. In general though if you can get up and down stairs, if you can sit on the floor and get up again, if you can kneel on all fours, if you can bend over and you have the all clear from your Dr, we should be able to help you. If you had a regular yoga practice before getting pregnant, then you can continue that practice with modification. If you haven’t done any yoga before, we recommend specialised Pregnancy Yoga (at Inna Bliss, Stretch Yoga or One Family Yoga). It’s not recommended to practice yoga in the first trimester of pregnancy. If you continue with your practice please discuss modifications with your yoga teacher. Yes, but not for the reason you might think. The average yoga class doesn’t burn that many calories so if you just want to burn calories, you’re better off at the gym. The way yoga works is by lowering our stress levels which in turn lowers our stress hormones which means we don’t hold onto excess weight. When we have high levels of the stress hormone, cortisol, we are prone to overeating, we crave sugar and fatty foods and we tend to gain weight around the middle. And even if you burn heaps of calories at the gym, this weight won’t shift unless you reduce your stress levels. Yoga teaches people how to calm their nervous system and relax their body and mind. Being calm and relaxed improves digestion and sleep and we’re more likely to make healthier food choices. People do lose weight with yoga but it’s slow and steady rather than a quick fix. Instant results don’t last and lasting results aren’t instant. Can I bring my husband/partner to yoga? Yes, we have lots of couples who practice yoga together. Bear in mind though that if you force someone to come to yoga they probably won’t like it. The better way is to convince them by role-modeling the benefits of yoga yourself. Can I bring my kids to yoga? We don’t offer children’s yoga, we aren’t insured to teach children and we don’t have Blue Cards. If your child is over 12 they are welcome to attend a class accompanied by an adult. Are there many men in a yoga class? It varies, usually 10-20% of the class are men. Women usually wear tights and a tshirt or singlet. If you wear shorts just be mindful of how much coverage they offer when your legs are open. Men usually wear shorts and a tshirt or singlet. No, you can borrow ours for free. If you have trouble booking online please text your full name and the class you want to attend to 0406 476 950 with at least 12hrs notice. We can only fit 30 people in and sometimes we get busy and have to turn people away. It would be really annoying if you put your yoga clothes on and got to the studio only to find the class full. We recommend booking for all yoga classes. You can only book a class if you have a current membership, otherwise, you will need to purchase a membership. You can book online via the timetable page. Select the class you want to attend and click ‘book’. You will be required to login or create an account.